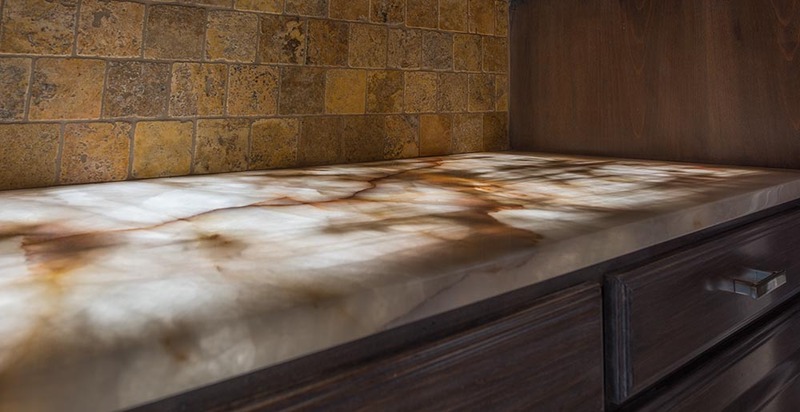 Backlighting backsplashes and countertops are pretty easy if you have a stone vendor with experience. 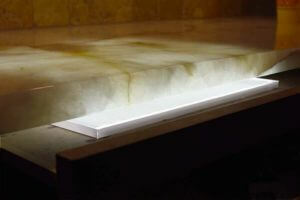 Question: Is Electroluminescent lighting the best way to light stone and glass? A few years ago electroluminescent panels were the way to light stone and glass. Now that edge-lit LED panels and LED back-light modules are affordable, they are the preferred light source. Edge-lit panels have better color, make no noise and a much longer life. The cost for LED lighting is about the same or a bit less than for electroluminescent. For a budgetary quote, you can use $75 per square foot for the edge-lit panel and back-light module. Some on-site cutting can be done to the back-light module and some installers find them preferable when a CAD file is not available. The edge-lit panel is not considered cuttable so it is important to order it in the correct size. For plumbing cut-outs, we will need a CAD file in a DWG or DXF format. Paper or cardboard templates cannot be used. Our edge-lit panels are NOT FROM CHINA but from South Korea and back-light modules are made in Louisiana. Delivery is usually within 14 business days. You have choices, we can provide you or your cabinet maker with individual LED back-light modules or edge-lit panels; several individual panels can be used or we can manufacture a large single sheet to fit under your stone. 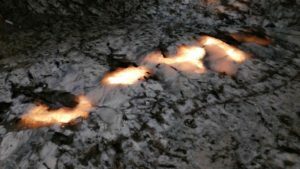 LED panels and modules rarely fail but, if you have a lighting strike it will be nice to be able to replace the LED lighting without having to remove the stone top. 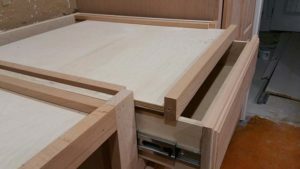 Have your cabinet guy add a small drawer like in the photo above to hold the panels or back-light modules. The drawer will come in handy if you start out with one or two panels under the stone and believe you may want to add more lighting later. 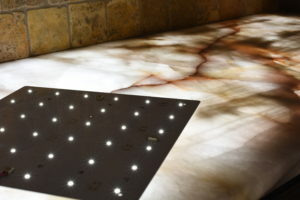 Most of the time the LED panel is placed on the counter base and the stone is placed directly on top of the LED panel. 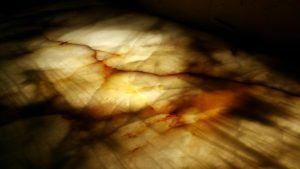 Sometimes stone that is usually opaque can have translucent areas that lend themselves to backlighting as seen in the piece of granite in the photo above. There is no law saying you have to back-lit the entire stone. You can choose to light just the interesting area or a few of them. A splash of color will add an extra visual dimension to an already beautiful artistic creation of nature. Come game day you can add your favorite teams’ colors if you are using Red, Green, Blue [RGB] LED panels or modules. Roll Tide or Geaux Tigers!